Alaie, Z., Mohammad Nejad, S., Yousefi, M. (2016). The Effects of Different Seed Layers and Growth Time on the Quality of ZnO NRs Arrays. 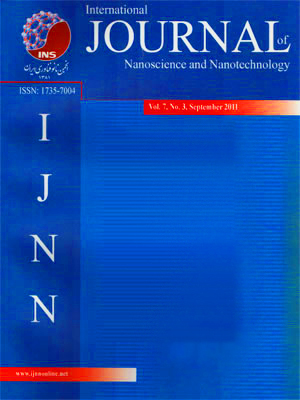 International Journal of Nanoscience and Nanotechnology, 12(2), 119-130. Z. Alaie; Sh. Mohammad Nejad; M. H. Yousefi. "The Effects of Different Seed Layers and Growth Time on the Quality of ZnO NRs Arrays". International Journal of Nanoscience and Nanotechnology, 12, 2, 2016, 119-130. Alaie, Z., Mohammad Nejad, S., Yousefi, M. (2016). 'The Effects of Different Seed Layers and Growth Time on the Quality of ZnO NRs Arrays', International Journal of Nanoscience and Nanotechnology, 12(2), pp. 119-130. Alaie, Z., Mohammad Nejad, S., Yousefi, M. The Effects of Different Seed Layers and Growth Time on the Quality of ZnO NRs Arrays. International Journal of Nanoscience and Nanotechnology, 2016; 12(2): 119-130. ZnO nanorods (NRs) were synthesized using an in situ low-temperature hydrothermal method. In order to investigate the effect of different seed layers on quality of ZnO NRs arrays, alcoholic, alkaline and acidic seed solutions were deposited by spin coating on ITO-glass substrate. Experimental results revealed that the vertically ZnO NRs obtained from monoethanolamine-based seed layer is the most uniform and compact one. Alkali solutions result in better alignment and uniform cross sections than those realized via acetic acid-based seed layer. Also, KOH- based seed layer show lower density and bigger cross section of ZnO NRs than that of NaOH based seed layer. Evolution of ZnO NRs layer was investigated by SEM images and UV-visible spectra at different growth times. By increasing growth time, the wavelength of UV-vis absorption edge exhibit a red-shift and the transmission of the light in visible and infrared regions decrease and therefore, the energy band gap of ZnO NRs decrease. Also, Oxygen plasma treatment resulted in increasing of UV absorption of ZnO NRs thin film. Scanning electron microscopy and X-ray diffraction spectra indicated that the crystalline ZnO NRs have rod shapes with hexagonal cross sections.